Who are the IoT Global Pack Leaders? And how does their background and existing expertise bring to their IoT market offerings? | Constellation Research Inc.
Who are the IoT Global Pack Leaders? And how does their background and existing expertise bring to their IoT market offerings? IoT as a term defines a ubiquitous state of Internet connectivity, resulting in new forms of data driving interactions that create new competitive Business value. As is usually the case with innovative, transformation technologies, Startups have initially led the way in creating new products, markets and business cases across a wide spectrum of deployments. Now increasing market maturity as allowed a range of global corporations enter the IoT market and make their presence. The eighteen companies listed below are World recognized market leaders in different business sectors; now they are direct competitors for a part of the overall global IoT market place. Each is using their present markets, experience, and customer base to define their IoT ‘go to market’ strategy. The resulting differences in their offerings are benefiting buyers by increasing the breadth of IoT solutions available. IoT sensing, together with the business solution requirements for data analysis and ‘real time’ smart services are a broad technology capability that can be applied in many different scenarios. However current business cases for deployment currently usually focus on one of the following three core improvements and in turn that tends to emphasis one particular technology product approach. As an example People working outside the office ‘on the road’ would usually be reliant on ‘mobility’ as a core IoT solution feature. People who benefit from being provided with remote ‘real time’ sensing information. As the costs of sensors and network connections have continued to drop even simple schemes to stop merchandisers from making wasted journeys to vending machine contents pay off. More sophisticated deployments allow preventative maintenance to make a substantial difference to Service Engineering operations. Hotels can even ensure that Guests will enjoy fully operational facilities whilst the hotel operator can optimize costs for providing hot water, making a double gain of customer satisfaction and operational cost reduction! Machines can have their individual performance improved, or can work in coordination with other machines more efficiently. Railway locomotives, even Farm Tractors and their attachments, now use sensors for customized operational optimization. Dynamic, responsive management of complex operations is starting to transform some industry sectors from Products into ‘Services’. At the other end of the scale simple building sensors control reflex reactions to the heat of the sun, or ensure empty parking spaces are made visible to Smart Phone Apps. IT Systems benefit from the addition of ‘real-time’ data to their existing historical data both for direct inputs to Enterprise Applications, and to offer previously unknown data with new insights to existing Analytics. The comparison between the planned and recorded activity with the dynamics of actual events is transforming ERP capabilities in areas such Logistics, Manufacturing, or Retail. CRM and Big Data Applications often discover radically change perceptions through the previously unforeseen ‘insights’. 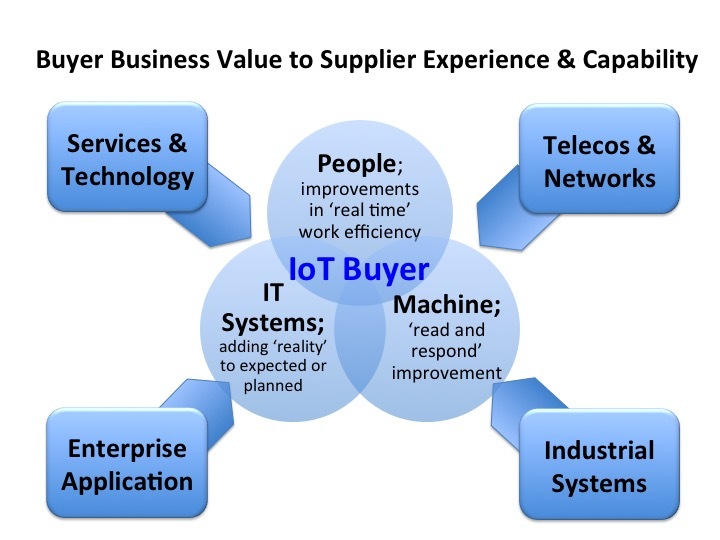 Value Proposition with the associated Business Case justification are by their nature highly focused, but as more and more IoT deployments take place in an enterprise then a variation of Metcalf’s law in respect of the multiplication in the value of each individual sensors data correlated with the overall picture becomes apparent. At this point it also becomes clear that the separation around People, Machine and IT Systems is now a barrier, and that a new generation of Enterprise wide function and capabilities is becoming established that requires the integration and free flow of all Enterprise IoT data. The dangers of initial separate Buying decisions resulting in medium term Enterprise incompatibility is very real as an example using the procurement of a Building Management System and the implications makes clear. Diagram; The inner ring of the three major initial business drivers is matched to the outer square of four boxes that contain the four capability backgrounds from which Global Corporations now contesting for a share of the IoT market are drawn. The heading ‘Services and Technology’ is less obvious than the other three and is used to describe corporations such as Amazon, Google, Microsoft, or Salesforce all of whom are competing from the provisioning of new Technology Services. The diagram makes clear the likely, familiar relationships that will drive many enterprise buyers to towards established relationships; IT Systems buyers and Enterprise Application suppliers; Machine buyers and Industrial Systems Suppliers, both being obvious pairings. Mobility deployments have also created a certain degree of a relationship between People buyers and Telecoms suppliers, whilst ‘Services and Technology’ has the advantage of driving innovative initiatives offering a broader value to any of the buying propositions. Exploiting existing relationships for synergistic advantages usually advantageous as long as a clear vision is maintained to ensure enterprise wide ubiquitous capabilities can be developed from the initial highly focused deployments. It is possible to identify eighteen well known major Global Corporations that have made a significant commitment to IoT and entered the market with strategically designed products as a part of an identified business solution. There are well known names with IoT products that have not been included either because they are not a Global player even though their contribution is significant, or their strategy commitment is not clear. There are some outstanding suppliers at a national level, such as KPN, the Dutch Telecom, who has rolled out LoRa IoT services with coverage across the whole of the Netherlands in a clear strategic commitment to the IoT market. And of course there are smaller innovative suppliers whose products may be critical success factors in Enterprise solutions. It is difficult to compile a listing to cover the diversity of this element of the IoT market. Therefore the following listings are limited to eighteen of the best known Global Corporations categorized by existing major sectors and experience, and presented alphabetically in each category. Has moved strongly into consumer IoT based Smart Services acquiring Home Automation leader Nest and its installed customer based from which to expand into all aspects of the consumer IoT market. Enterprise Business strategy is less clearly differentiated around expanding Cloud Services to support IoT and the planned expansion of an IoT orientated fiber optic network across cities and business zones. All IoT devices need processor chips, but Intel see the importance of the processor to embed IoT requirements from network types to security management. Intel has introduced specialized products such as the Quark for small-form factor appliances demanding low power computation, through to extensions to Atom range including rich graphic rendering aimed at interaction through pictures and graphics. Listed under Services for its non IT enterprise application focused introduction of Azure based Services including an IoT Suite with a sophisticated and integrated set of functions; IoT Hub connection, event notification service and device management; streaming analytics service combined with machine learning; and linked Business Intelligence. Microsoft aims to add to its existing preconfigured IoT templates to broaden technology and business solutions. Though previously identified as a supplier of modeling software and product lifecycle management (PLM) tools PTC has moved to become an IoT player through strategic acquisitions. A comprehensive solution approach combines ThingWorx, an IoT application development platform; Axeda, a cloud service for managing connected devices and processing machine-to-machine data; and Coldlight, a machine learning/artificial intelligence platform for analyzing data. With a clear focus maintained on improving all aspects of the customer / sales engagement Salesforce.com sees IoT as being able to bring new insights to learn how customers react and behave with connected products. Salesforce.com has added IoT Cloud, a real-time processing engine named Thunder and extended Lighning to ensure that IoT is fully integrated into all aspects of Salesforce Services. In its normal role as a Semiconductor company Qualcomm has introduced a series of IoT-optimized chips named SnapDragon, that offering a variety of connectivity services and platforms. Qualcomm has acted boldly in the Software market place by taking a leading role in the Open Source AllJoyn project aimed at creating open source protocols for IoT devices. The functionality of the AT&T broadband network and M2X, cloud-based data storage service has been extended with Data Flow, a specialist development portal for building IoT applications. AT&T is aiming to provide ubiquitous capability for mobile devices and states an aim to have 10 million vehicles/objects connected through its Broadband network by 2017. With its huge installed base and range of networking products Cisco predicts that it will be connecting up to 50 million IoT devices by 2020. Extended network IoT services range from specialized Gateways and Management to the concept of Fog Computing. This specialized IoT decentralized architecture moves data collection, storage and analysis to the network reducing network traffic and improving response times. As a major supplier of consumer devices Samsung states it will aim to make its range of phones, appliances, televisions, as well as industrial products all Internet connected by 2020. Samsung is also developing a range of ARM chips for its devices, together with a library of APIs to encourage the overall growth of the IoT market. To build on and extend their traditional market into IoT presents Huawei has launched LiteOS a micro operating system for IoT as well as joining various industry groups on standards and Open Source. Huawei believes it is well placed to be the IoT market leader in Asia as well as a powerful player in the US market. A prime European leader with commercial and consumer operations plus a specialization on Automotive boosted in its home market by the German car industry. Enterprise software. Less well known as a supplier of certain types of Enterprise software with IoT Cloud based data management, Bosch is also a key supporter of the European driven Internet 4.0 initiative. The prime force behind starting the US based ‘Industrial Internet of Things’ movement aimed at optimizing connected machines for manufacturing based on a huge amount of experience in Industrial Automation. GE has a very strong vision of a software driven future with IoT data integrated through Predix, GE’s advance ‘smart’ cloud-based data and analytics service that has a number of substantial industry sector transformations as case studies. HDS, the technology arm of Japanese industrial conglomerate Hitachi, and is partnering with Intel for IoT machine and industrial equipment capabilities whilst developing its own cloud-based platforms to collect and analyze IoT data. HDS believes it brings a unique combination of industrial hands-on equipment and back-end technical services to the IoT market place. The emerging IoT market is seen as an opportunity to move into ‘Integration and Services’ business as well as add IoT to its traditional enterprise hardware products. New products add endpoint connectivity for IoT devices plus back-end storage and analytics platforms for the management of IoT data. A strategic partnership with Intel resulted in a joint IoT Executive demonstration facility near San Francisco. IoT means more Data to drive smarter services and reaction to IBM with its investments in Watson “Cognitive Reckoning”. Watson is intended to provide a cohesive integrated environment covering all aspects of IoT from cloud-based development and operating environments/services for Apps and Services including specific packages for various industry sectors. With the introduction of IoT Cloud and Services prepackaging for workflows services Oracle aims to make its databases and enterprise applications part of an integrated platform. The addition of IoT data input for SQL, NoSQL and Hadoop databases links Oracle Sales cloud, Service Cloud and CRM into the IoT environment.